All Weather Rattan just got an attitude! Sturdy, fun and ready to socialize, the Fiesta Chairs are a must for your Mexico entertaining. 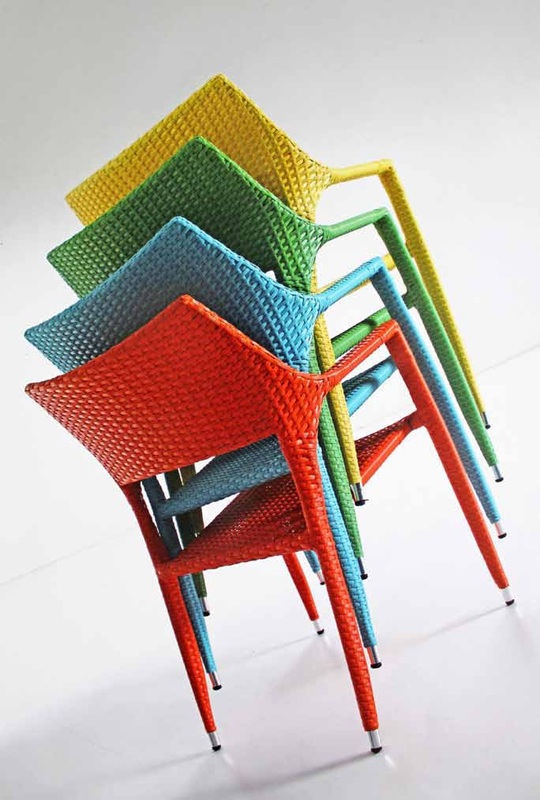 All-Weather rattan in bright colors woven over an aluminum base. All Weather Rattan just got an attitude! Sturdy, fun and ready to socialize, the Fiesta Chairs are a must for your Mexico entertaining. Bring them out for your parties, stack them up to store them, or bring them into your Mexican indoor dining room or living room. They will be sure to make an enjoyable fiesta in your patio, pool area, or anywhere else in your Mexican home. Friendly yet seriously durable. All-Weather rattan in bright colors hand woven over an aluminum base. Please note: Price is per chair. We love this chairs and we know it is impossible to buy just one. Ask us about volume discounts.